Shares in Tox Free Solutions reached an all time high of $3.19 on 15 January. Last June they were $2.29. Kathy Hirschfeld has been appointed a non-executive director. She is a chemical engineer with international experience in non-executive and executive roles. Ms Hirschfield was a senior executive with BP with roles in oil refining, logistics, exploration and production. She is a past managing director of BP Refinery (Bulwer Island) Pty Ltd, a past non-executive director of Refining New Zealand Ltd and a past executive director of BP Australasia and BP International Refining. Shares in Gale Pacific spiked 5 cents to a new five year high of 35 cents on 15 January. Volume was also higher than normal. No news accompanied the rise. Australian Ethical has posted a series of video presentations on its web site that discuss its funds and investment approach. 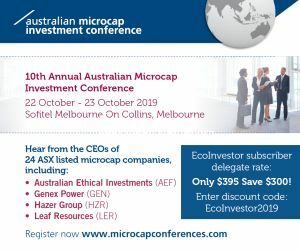 Speakers include chief investment officer David Macri on performance; portfolio manager for the Smaller Companies Trust, Andy Gracey; portfolio manager of the International Equities Trust, Nathan Lim; Duncan Paterson of CAER on Australian Ethical's ethical charter; and Dr Stefan Hajkowicz of the CSIRO on global megatrends. CBD Energy has entered an agreement to re-issue US$2.4 million of convertible notes plus interest at a conversion price of 5.3 Australian cents and an additional US$100,000 of new convertible notes to existing note holders on the same terms  a total value of US$2,745,200. The interest on the notes is 9.75 per cent per annum. The company said the re-issue is another step in its program to reduce current liabilities and improve balance sheet ratios. It follows the recent debt repayment of $10.8 million after the completion of the 5 MW Italy Solar project sale. CBD shareholders will meet early this year to vote on CBD's proposed merger with US based and NASDAQ listed, Westinghouse Solar. Managing director, Gerry McGowan, said "We see the re-issue of these convertible notes to a US based party who is a significant investor in both CBD and Westinghouse Solar as a vote of confidence in our impending move to the NASDAQ exchange. The premium to the current share price at which the notes have been issued indicates a belief that we will see a re-rating of the stock in the future." Clean TeQ Holdings has appointed Tony Panther as chief financial officer (CFO). The appointment of a full time CFO will strengthen the executive team and support the financial management of its commercialization activities including licensing and joint ventures in various jurisdictions, said chief executive, Peter Voigt. August Investments has published its portfolio and valuation as at 31 December showing that its shares now have a value of $190.63, up from $185.78 at 30 September and $176.01 at 30 June. See story under Australian Ethical Smaller Companies Trust. Brendan Dow has resigned as a director of Ceramic Fuel Cells. Until recently he was managing director. No reason was given but the board thanked him for his contribution and commitment over the last seven years. Aeris chairman Maurie Stang has indirectly acquired 18,000 shares at 17 and 18 cents each. The company has issued 287,500 shares on conversion of convertible notes at 20 cents each, and 12,500 shares as interest on the convertible notes. In recent weeks Australian Renewable Fuels has increased its interest in Wentworth Holdings from 19.4 per cent to 38.4 per cent under its merger agreement with Wentworth. The merger is subject to a 90 per cent acceptance target, but Wentworth has now received a letter from major shareholder, Thorney Investments, saying it wants to discuss an alternative proposal. Cardia Bioplastics raised $399,000 under its recent share purchase plan. The funds are for working capital. Metals recovery company Electrometals Technologies said its trading results and performance for the second half of the year improved; and although it is likely to have traded at a loss for the half the full year loss is expected to be at least $1 million less than the $2.9 million loss in 2011. Green Invest has signed a non binding term sheet for a $5.8 million funding proposal from a lender introduced by its advisor, Domain Capital. It has also made substantial progress in the US with a new Green Cities program. The funding proposal is a mixture of debt, equity and a convertible debenture. The funds will be used for the acquisition of the Ecofish property and assets at Glenview in Queensland; re-commissioning and expansion of the property to establish a fish growing facility of 350 tonnes; and an equity position in an Asian fish farming project which proposes to utilize the RAD technology, and where the lender has allocated an additional $1.2 million of equity to itself invest in the project. The funding proposal is subject to conditions including due diligence, the purchase of the Glenview Property plant and licenses, the purchase of the RAD technology excluding China, and approval of any necessary components of the transaction by Green Invest shareholders. GNV will hold a shareholders' meeting as early as possible in 2013. Green Invest has been seeking capital to add a sustainable food division to complement its water and energy divisions. The new division will source income from project/ farm management and from production. The directors said they believe that the proposed production income will, after initial establishment, provide strong revenues. Chairman Peter McCoy said the Green Plumbers brand has made substantial progress in the US where a Green Cities program has been established. Developed with Niagara Conservation Corporation, the water saving program is voluntary and offered to all utility customers in various municipalities. Those who participate pay an agreed amount through their water bill. The products installed include a suite of best-available water technologies and are usually financed over a five year period. Monthly utility savings are said to be typically twice the monthly payment, and the average cost of product and installation is US$250. Product is installed by trained Green Plumbers and where possible the plumber is local. Green Invest said this is the first example of the revised Green Plumber commercialization model announced last year. Under the program, which is governed by a Master Licence Agreement between Niagara and GPI, GNV will receive a commercially confidential variable royalty payment determined by factors including whether the project is an existing Green Plumber project developed by GPI independently of Niagara or is jointly developed or developed by Niagara. Niagara projects a pipeline of over $100 million in potential Green City deals. Key states where multiple utilities have expressed interest include California, Colorado, Texas, Georgia, Florida, North Carolina, and New Jersey. It is anticipated that a number of contracts will be signed shortly and announcements will be made as contracts are executed. GNV intends to adapt the model to Australia where discussions are underway with funders and manufacturers. Through the Green Cities program, Green Invest has signed a pilot program with American Water Inc. The contract is to install and retrofit plumbing product directed at low income customers of American Water - initially in California Service areas. American Water is the largest publicly traded US water and wastewater utility company. It provides drinking water, wastewater and related services to about 15 million people in over 30 states and parts of Canada. Green Invest has also announced an increase in Green Plumber member states in the US to 46. During the last six months membership has grown by 15 per cent and Green Invest's US management projects an 88 per cent renewal of Green Plumber membership. Pacific Environment has concluded a new loan agreement to replace the agreement that was due to expire on 27 November 2013. The new loan expires on the 30 of June 2017. Executive director Robin Ormerod agreed to renew his convertible note arrangements, which the company said allows it to focus on continuing its restructuring and consolidation program without the pressure of the debt requiring full repayment in 2013. The loan is for $1.8 million and the interest rate on the outstanding amount is 11 per cent per annum including a 2 per cent discount while the loan is not in default. Phoslock Water Solutions is undertaking a share purchase plan for up to $15,000 per share holder at 4.6 cents per share. The company may cap the total amount of shares issued to 43.5 million to raise $2 million. Its major financier has agreed to convert its current unsecured $1.3 million loan due 31 March 2013 to a $1.3 million convertible loan due 31 December 2013. The holder will be able to convert all or part of the loan to PHK shares at 4.6 cents per share. As the financier is a related party, shareholder approval is required. Style has agreed to a recapitalization proposal with Otsana Capital, and said that when it is implemented it will apply to be reinstated on the ASX. The proposal involves Style consolidating its shares on a one for one hundred basis. It will also issue the following securities on a post consolidation basis: 30 million shares at $0.00001 each to raise up to $300, up to 500 million shares at an issue price of not less than $0.005 each to raise up to $2.5 million, up to 50 million free options for the purchase of 1 share each exercisable at 0.5 cents, and up to 100 million free options for the purchase of 1 share each exercisable at 1 cent each. $500,000 of the funds raised will be used to pay out a debt to Strandtec Pty Ltd. The balance will be used to develop the company's business, review new business opportunities and for working capital. A deed of company arrangement (DOCA) will extinguish all pre-administration creditors. The proposal is subject to a number of conditions. In an update, WestSide Corporation said it is continuing to progress discussions with the party which submitted an indicative, conditional, non-binding and confidential proposal on 19 November 2012. In the next few weeks Lynas Corporation expects to have available commercial rare earth products, as the company has commissioned the cracking and leaching rare earth extraction units at its Lynas Advanced Material Plant (LAMP) in Malaysia. The company said this involves the cracking of the concentrate through the kilns followed by the leaching circuit to produce a mixed rare earths sulphate. The process has achieved recovery rates of over 90 per cent of contained rare earth oxides (REO). The mixed rare earths sulphate is now being fed into the solvent extraction units for ultimate production of individual rare earth products, it said. Commercial rare earth products should be available in the next few weeks and ramp up of production will occur over the next three months. "This is another significant milestone for Lynas," said executive chairman, Nicholas Curtis. "The safe and efficient operation of the LAMP is now a reality, and we are providing real-time data that assures people the LAMP is entirely safe for our local communities and the environment. We are excited to start creating value at the LAMP, and we look forward to sharing that value with all of our key stakeholders, including the communities in which we operate." The report into the accident at Galaxy Resources' Jiangsu Lithium Carbonate Plant has concluded that on shutdown of the plant, an abnormal and unexpected blockage in the vertical crystallizer section held up a mass of sodium sulphate liquid, the force of which, on subsequent unforeseen release, caused the fibre glass pipe work at the U bend section to rupture on impact. Due to the highly abnormal nature of the incident, the risk of this type of incident was not identified by the designers or safety studies. China's Suzhou Safety Bureau has agreed with Galaxy's proposal to replace the ruptured U bend section with stainless steel (2507) material with additional load support. The repair will be completed by early February ready for plant recommencement. Galaxy said it is saddened to report that a second employee passed away as a result of infection from injuries in the incident. A result of the plant shutdown Galaxy has made modifications to the plant to improve operability and throughput. A complete Hazard and Operability (HAZOP) review has been conducted on the entire operation to ensure ongoing safety. Other shutdown activities are on schedule. The company expects to begin the kiln dry out process at the end of January. Orocobre and joint venture partner Toyota Tsusho Corporation (TTC) have executed the loan documentation for the project financing for Orocobre's flagship Olaroz lithium project in the Province of Jujuy in northern Argentina. Algae.Tec has received approval from the Australian Government for a $12.15 million cash refund on Australian and overseas development expenditure for the financial years 30 June 2012 to 30 June 2015. The R&D Tax Incentive allows for an initial $27 million spend on Algae.Tec technology developments, of which the Government will reimburse 45 per cent or $12.15 million. The approval is to support the funding of at least three algae bioreactor facilities in Australia, Asia and the USA. The refund will be paid in cash following the expenditure. Expenditure additional to the initial budget of $27 million will also be eligible for grants. Managing director Peter Hatfull said the company had applied for the approval last year as part of a range of attractive financing options available for the company's growth. "It was a rigorous process involving a complete review of our technology and global expansion plans," he said. "This is excellent news for the company and our Australian and international investors." Meanwhile, Algae.Tec has issued 240,385 shares at 20.8 cents each to La Jolla Cove Investors to raise $50,000 under their convertible note arrangement. Mr Hatfull has indirectly acquired 68,313 shares at between 29.6 cents and 27.5 cents each. In other news the company said "Algae.Tec is expanding after the US approved a $1.01 a gallon tax credit for producers of algal fuels. That followed a decision by the Environmental Protection Agency in September to raise the requirement for biodiesel in refined products. A year earlier, US regulators allowed airlines to fly passenger jets using a biofuel blend." AnaeCo and Repindo Resources Pty Ltd have signed a Memorandum of Understanding to examine the implementation of AnaeCo's DiCOM Alternative Waste Technology at a suitable site in Basra in Iraq. The parties will consider the technical and commercial feasibility of deploying DiCOM under licence. AnaeCo would manage the design and commissioning of a potential 500,000 tonnes per annum facility and Repindo would have project management and construction responsibilities. The waste facility under consideration will be owned and operated by a joint venture company between Repindo Resources Pty Ltd and Basra Governorate Council. It will offer a sustainable solution for the continuous growth in municipal solid waste in the region, and Repindo is working with Basra Governorate Council to bring the facility to fruition. "We are committed to implementing solutions for waste management, which are environmentally friendly and commercially sustainable, across Asia, the Middle East and North Africa," said Bill Knowles, director of Technology and Infrastructure Repindo. "AnaeCo's DiCOM System aligns perfectly with Repindo's goals. Their world leading technology provides a sustainable solution for the essential service of waste management." In an update on its Réunion Island CETO Project in the Indian Ocean, Carnegie Wave Energy said it expects to commission a CETO 4 unit during the first quarter of 2013. The project, in partnership with French power utility EDF EN and French maritime defense specialist DCNS, is deploying a 10 metre diameter current generation CETO 4 unit and subsea energy management system. EDF EN has previously informed Carnegie that the energy management system and the CETO unit have been installed except for the CETO buoy, which was waiting a calm weather window for towing to the project site off the south side of the island. EDF EN has informed Carnegie that the buoy has completed its tow tests, however given that some of the system components have been under the sea for 12 months, DCNS will now perform inspection and maintenance activities to ensure the system performs as designed when the buoy is installed. This process is expected to complete in the new year followed by commissioning. Dyesol received a query from the ASX when its shares jumped from 13.5 cents on 10 January to an intra-day high of 18.5 cents on 15 January, and on increased trading volumes. However, Dyesol said it had no explanation. In early January the Tulloch Group announced it had reduced its stake in Dyesol from 10.29 to 9.29 per cent. Earth Heat Resources said its fully underwritten pro rata renounceable entitlement offer which closed on 11 January was very well supported with a take up rate of 88.5 per cent or 571,798,221 of the 645,757,529 shares available. The underwriter was DJ Carmichael Pty Ltd. To accommodate additional demand by the underwriter on behalf of non shareholders, the company has agreed to place another 200 million shares to sophisticated and professional investors on the same terms as the Entitlement Offer including the free attaching short dated and long dated options. EnviroMission has raised $335,000 through the issue of 11,166,666 shares at 3 cents each. 5,583,333 unlisted options were also issued with an exercise price of 3 cents and an expiry date of 15 September 2014. EnviroMission has received the first tranche payment of US$200,000 of a US$2 million Solar Tower development license fee under an agreement with a Texas based development group. The balance of the fee will follow completion of the Heads of Agreement currently being prepared by EnviroMission's lawyers and expected to be executed in early February. The Heads of Agreement will set the terms and conditions for the granting of the exclusive rights to develop the Australian Solar Tower concept in the State of Texas to the Texas based development group. EnviroMission will own 20 per cent of the Texas Solar Tower' development company in the first instance. This holding will not be diluted to less than 10 per cent and will then be free carried and non diluting. K2 Energy has released its Notice of General Meeting, Explanatory Memorandum, and Prospectus for the general meeting to be held 20 February in Sydney. The meeting is seeking shareholder approval for, among other things, for K2 Energy to acquire all of the securities in MEARS Technologies, Inc that it does not already own. The transaction structure is known in the United States as a reverse triangular merger. Lithex Resources has appointed John Conidi as a non-executive director. Mr Conidi is managing director of the ASX listed Capitol Health Ltd, a position he has held for five years. In that time he has increased revenue fivefold, paid dividends and reported record profits, and executed over a dozen acquisitions. Shares in Water Resources Group fell to an all time low of 1.4 cents on 9 January. The company has since announced that it has agreed to expand its license relationship with Mandala Water Ltd to include The Republic of Mauritius - an island 1.3 million people in the South West Indian Ocean. WRG said it recently took steps to move from a joint venture to a licence agreement with Mandala Water, allowing it to participate in up to 49 per cent of any project. This also allows for Mandala to fund early stage projects independently and without financial commitments from WRG. The United Nations Environment Program is said to have reported that the availability of fresh water in the region is a priority issue due to variable rainfall and high run-off; increasing domestic, commercial, agricultural and industrial consumption; and a lack of storage capacity. Pollution from a variety of sources and environmental degradation are also restricting water for human use. Water supplies per capita are predicted to be within water stress levels by 2025. In April 2012, the former President of Mauritius, Monique Ohsan Bellepeau, implemented a major water management reform program as well as a plan to meet all future needs until the Government achieves its goals of a 24/7 supply of clean water for the population. It was also stated that the Government would legislate to ensure that all hotels and major hospitality centres will be equipped with water desalination plants. Water Resources Group chief executive, Brian Harcourt, said "We believe that our partner, Mandala Water is well placed to secure water supply contracts in Mauritius and we look forward to significant new business arising from this region." Market research and consulting firm TechSci Research has reported that due to governmental support and increases in demand, the Indian water desalination market is set to register a compound annual growth rate of 22 per cent over the next five years. In partnership with Mandala, WRG expects to build several demonstration scale plants in the region later this year with a view to completing equipment sales within the next 12 months.